Former Greek midfielder. Kostas was versatile midfielder capable of playing deeper in midfield but also in more advanced position. Pretty mobile player with good passing range, pace and technique. He was also known for his well timed runs in the box and he scored a lot of goals as well as numerous assists for Antoniadis. He began his career at his team Fostiras, which signed statement to the age of 12 getting in return a large bottle of milk and a piece of baklava! At the end of the 1963-64 season at the age of 14 years included in hexadecimal team in match against PAOK Toumba. Finally, the first official game that struggled with Fostiras was the next period (1964-1965) for the National League B, since in the meantime the fostiras was relegated. It was at Peristeri vs Atromitos where he played as right out and scored twice. In 1968 obtained from Panathinaikos after adventures, and a love so AEK and Olympiakos. Panathinaikos was twelve years knowing successes. Important moments in participation in the group was the European course 1970-71 (scoring two goals) leading to the final of the Champions League and winning a double (1977), four championships (1969, 1970, 1972, 1977), two Greek Cups (1969, 1977) and a Balkan Cup (1977) in which he scored in the final. On a personal level elected Footballer of the Year by the sports editors of two years: 1971 and 1972. Moreover, 1972 was included in 16ada the best players in Europe in the competition Ballon French magazine France Football. There was interest in the transfer of Real Madrid and later in Everton and Juventus, which ultimately did not come to fruition. The serious knee injury in May 1977 in a match against Ethnikos Piraeus, affected subsequent performance. In 1980 he left Panathinaikos going to AEK, where he played for about a year. 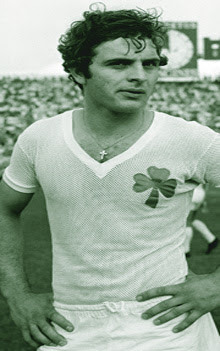 Then retired, but after managed to fight for another year (1981-1982) and the Second National Championship with the shirt of Fostiras. Until then had competed in 331 races of A' National (308 Panathinaikos) having made ​​88 goals (83 Panathinaikos). In 1967 he was invited to the National men, aged just 17 ​​years, but his debut was held two years later, on March 12, 1969, in a friendly match against Israel in Tel Aviv. He fought alongside and national youth team and hope, while later in the National Defence, as presented as a volunteer to finish faster the term. It was then that John Diakogiannis wrote in an article that if this continues it will destroy his career. In 1968 he was invited to the National Youth of the then coach Lakis Petropoulos. After test events chosen in the inspection which took place at the European Championship in Cannes, France. There was established by Petropoulos in midfield, a position he played later in his career. The team reached the final rounds as he excelled and was named best player of the tournament. He played a total of 33 times with the National Team and scored 5 goals . More or less He score as many goals as Domazos, I think He deserves at least 80 in SA, plus his DA seems low, should be higher at least 89, He was very successful in this aspect.